This one is even tougher than the Clash! You are by alone in thinking Technique is the best album from beginning to end. Two songs I have to find room for are Dreams Never End and Thieves Like Us… Just not sure what to replace. Can’t wait to listen to this comp as you designed it. Happy Friday for sure. Same here , would have to fund a place for thieves like us at the expense of lonesome only because hadn’t heard it until this post. Remembering what an amazing run of singles the band had. I guess as I am pop at heart 1963 and bizarre love triangle 12″ would knock off run and ceremony. I agree about Technique though, pound for pound their best album. Everything’s Gone Green would have to be on for me, and as Brian says Dreams Never End and Thieves like us are pretty essential too. BLT would replace Blue Monday for me. From post 1990 I’d argue for Regret. Thanks. Only problem is that the link for Ceremony brings up the Box log in. Thanks Murray. It was put together when I was very tired late at night and that’s my excuse for the mistake!! I wouldn’t even know where to start with New Order. I couldn’t do two sides of vinyl, it would have to be a multi-CD box set. I do agree with everyone about Theives Like Us. 1963 would have to be on there too, BLT and Round & Round… oh dear, see what I mean??? Still, a brave move JC, and ultimately a triumph I feel. Mission impossible… I would probably exchange the True Faith mix to the dub remix version, and include World (Price of love) – just not sure which mix. As soon as I post this I know I will realise that I want to change my mind, again. 10 songs only is a tough limitation, even with the vinyl ownership term. i think a lot of personal preferences are linked to whatever period anyone really fell for the band. There is just no way, having been a JD fan, could I ignore Ceremony even though it is so out of kilter with much of the later output. Great LP JC, reminds me how much I used to love NO back in the day. I was a JD fan too, and I couldn’t contemplate leaving Ceremony out either; in fact I’d also have something from Movement in there, probably Dreams Never End as Brian suggested, or maybe Doubts Even Here. Not seeing much love for tracks from Brotherhood on here, but I don’t mind that at all! This is an awesome challenge. I’ve always held “Lonesome Tonight” in the top 10, and “Leave Me Alone” in the top five. It’s always interesting to hear big fans argue their choices. It helps me listen to old songs in a new way. Thanks for putting all these “Imaginary” links together. I look forward to this blog every morning! Best from Oakland New Order fan. The perfect kiss is a sublime single. I have this one. A very reasonable and well defended compilation JC! For me, Run would get cut and Thieves Like Us found a place and Sunrise would replace Leave Me Alone. I understand how many rate Technique as NO’s best/most successfully realized album, but for me that HAS to be Low-Life. Timely comp with new New Order on the way, although I don’t think any post-Technique would make it on to my album either (I do have some on vinyl). I would have to have some Movement, probably Dreams Never End, and some Brotherhood (maybe Weirdo), also Procession and Shellshock. I love Love Vigilantes story telling but non-NO fans I know site it as the definition of bad Barney lyrics. 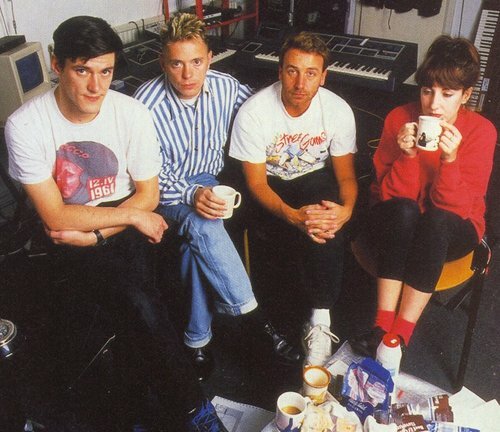 Speaking of the new New Order album ‘Music Complete’, which is due out in September, I wonder who they were thinking of when they came up with the track ‘Nothing But A Fool’…? I may be wrong, but I can’t see a full reunion on the cards any time soon. An almost impossible task JC. Can’t fault any track here, but would have to find room for Bizarre Love Triangle. No idea what I would take out right enough. Totally agree about Technique being their best album, with Low-Life just behind it. Incredibly difficult and I can’t fault any of your choices. Sub-culture and 1963 would have been in my thoughts if I were putting the album together, but I can’t realistically put them in for any of your 10. I’m going to make a late shout for Face Up off Lowlife. In place of what I don’t know. Maybe we need a non singles NO compilation. Add Angel Dust and All Day Long and it would be superior to any of the “Best Of’s” released in the last decade. But other than that its hard to argue…..